Mission Exceptional is an annual competition giving students the opportunity to put their business knowledge into action to help them to prepare for the workforce. It often requires participants to present feasible strategies for a ‘real-life company’ with regard to how it can raise profits whilst creating social values. The proposal presented by Angus and Will in this year’s competition was judged by the panel as the most engaging and innovative strategy. “I’m thrilled to have won and I particularly enjoyed focusing on the importance of social aspects as well as financial,” Will said. As the winner of the challenge, the team will travel to Singapore in December to job shadow the New Product Development Director of American Express. Mr Dow said “We put so much effort into this and it has been a great learning experience which is set to continue”. Congratulations again to Angus and Will. We hope to see more students get involved in such an ‘exceptional experience’! 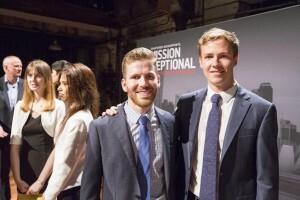 If you are interested in participating in Mission Exceptional 2015, please click here. This entry was posted in Alumni Newsletter articles and tagged charted accountants, competition. Bookmark the permalink.